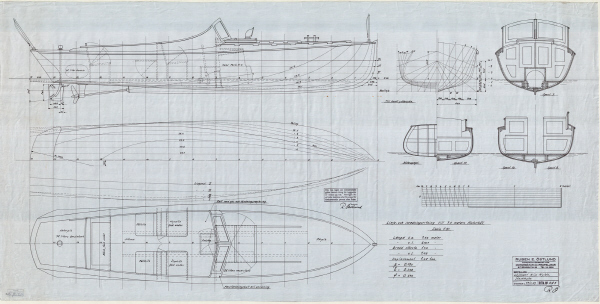 I came across these lovely drawings of a very nice looking launch while researching the boats of C.G. Petterson. 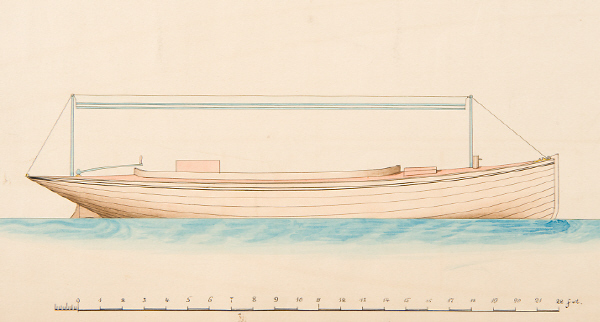 His archive is held by the Swedish National Maritime Museum and they have a wonderful digital archive. 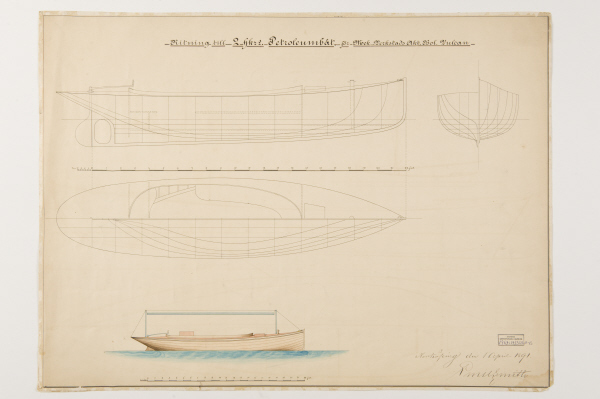 The boat was designed by Emil Smith in 1891 while it incorporated cutting edge technology it has retained a refined elegance that most modern power boats lack. One hundred and twenty years ago the petrol engine was only starting to become widespread, if you could even say that. A two horsepower engine was as powerful as most got, anything more powerful would have been too heavy for a fine lined boat of 22 feet with a 6 foot beam. I presume that a 2 horse power engine in 1891 had a bit more torque than a modern equivalent and as such could have turned a nice large and efficient propellor. But how about a nice quiet and powerful electric motor with a petrol generator back up? Nothing too complicated in that set up. It wouldn’t cross oceans or break speed records but it would be one very classy and eco-friendly boat. Doubly so if the batteries were recharged from wind or solar. Not impossible if it were only used at the weekend. She certainly would make a very fine dayboat with the wrap around cockpit seating and that beautiful counter stern would make her an ideal canditate for a tender for a larger classic boat. She could ferry the crew out and friends and family could watch the racing from her or go off fishing or beach hopping in 19th century splendour. Low power motor boats are the future and while engines and building materials have changed somewhat in the 120 years since this boat was designed the sea and the forces it exerts have remained the same. Beautiful fine lined and simple boats like this one will be as good in another 120 years as they were when they were first built. Of course if you would like a silent, capable and good looking boat to travel about in the style and comfort of another era why not give me a call +353 (0)28 38973 or +353(0)86 158 69 37 or or e-mail roeboats@ymail.com to discuss having your perfect boat built. This entry was posted in Boat Building. Bookmark the permalink. ← Roeboats feature in Wooden Boat Magazine’s Small Boat Annual. Ich kann Deutsch sprechen. Ruf jetzt an! +353 28 38973 oder SKYPE ist moglich. Enter your email address to follow this blog and receive notifications of new posts by email. Emails are not used for any other purpose.